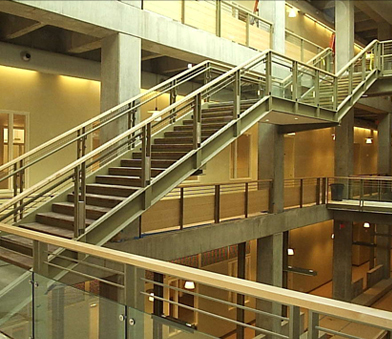 Smith Architectural Metals specializes in the fabrication and installation of all types of metal stairs. Our stairs are fabricated to very high standards of quality workmanship from materials designed for the intended purpose of the stair. Whether standard, winder, scissor or monumental styles, all stairs are fabricated to meet the latest building codes and ADA requirements, in conjunction with the architect’s design. Fabrication of commercial pan-filled design, industrial grating, checkered plate, or spiral design will satisfy the needs of commercial construction. Smith Architectural Metals has the capacity and the capability to fabricate a wide variety of metal railings, including carbon steel, stainless steel, aluminum and bronze. Various types of railings can be produced, including vertical picket rails, multi-line horizontal pipe rails, decorative ornamental rails or cable rail systems of various designs. From elevator pit ladders, to galvanized roof transition ladders and caged access ladders, Smith Architectural Metals can meet all of your vertical ascent requirements. Safety gates, security gates and dumpster gates are also available to meet the site requirements. Smith Architectural Metals specializes in all types of miscellaneous steel fabrication. We can provide loose lintel angles, lavatory counter supports, overhead toilet partition bracing, elevator sill angles, separator and hoist beams, and steel corner guards. Steel catwalk systems, areaway grating and frames, trench drains or grates and covers of any type can also be supplied. Abrasive safety nosings for concrete stairs or steel pan stairs can readily be furnished for interior and exterior applications. Smith Architectural Metals provides a high quality primer in accordance with all specifications. We also provide hot-dip galvanizing of steel products, anodizing of aluminum and custom powder coating of steel or aluminum. Sandblasting and high performance paint systems can also be furnished by request to meet the job requirements. We can provide various polished finishes for ferrous and non-ferrous metals. Stainless steel and aluminum finishes can come in either mill, brushed or satin finishes. Smith Architectural Metals can furnish complete installation packages including all necessary equipment for all products that we supply. Our field personnel will be trained in all safety programs to be current with OSHA guidelines and requirements. Our project management team will work closely with each customer to meet the job schedule requirements. Attendance of weekly meetings and communication with each client will ensure the completion date of each and every project.